A summer afternoon of live music, Pimms, strawberries and afternoon tea and cake, gifts, raffles, tombola, games and so much more. We invite you to join us for an a fun summer afternoon being entertained by Black Strap Molasses, the ever-popular group of Eastbourne musicians and vocalists who bring an eclectic mix of folk, Americana and songs they have written themselves. Listen to them while enjoying a glass of Pimms, or sampling some strawberries and cream or afternoon tea and cakes. Perhaps try your luck on the tombola or raffles and browse the gift stalls – including the Friends of Eastbourne hospital’s flowers and gifts and the RSPB. 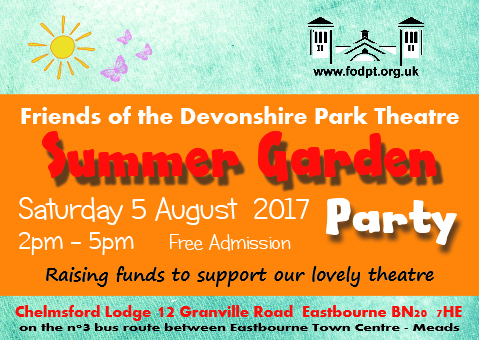 Come and soak up the atmosphere of a summer afternoon and help raise funds to support our lovely Devonshire Park Theatre.